Carving a pumpkin at Halloween is a time-honored tradition. Many families make an annual trip to a local pumpkin patch for one to place on their doorsteps Halloween night. If you have the room and the ambition, you can grow your own. Pumpkins can tolerate a variety of climates and be grown throughout most of the United States. 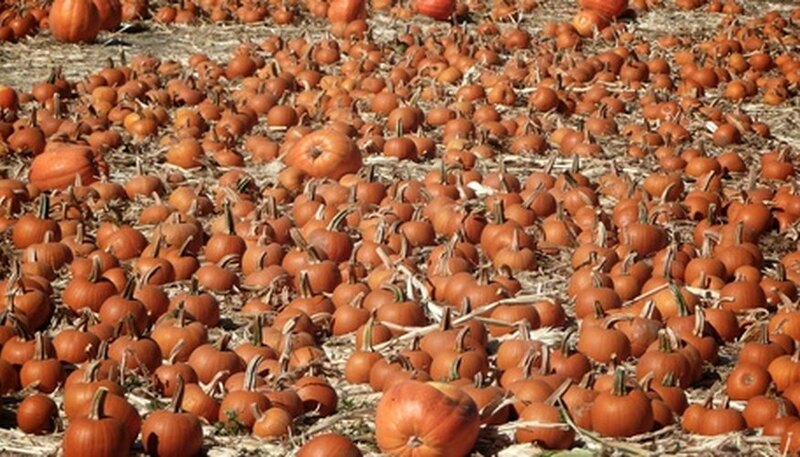 If you want to harvest your pumpkins for Halloween, plant them in late May or early June. Find a location for planting your pumpkin seeds. Choose a spot that gets direct sunlight every day. Pumpkins also need a well-draining soil because they won't grow well in wet soil. Dig a hole 2 inches deep using the trowel or small shovel. Do not plant the seeds too deeply, or they may not germinate and grow. Place two seeds in the hole and fill the hole with the remaining soil. If you are planting multiple plants, holes should be spaced 2 feet apart and rows should be 4 feet to 6 feet apart. Pack the soil surrounding the hole firmly so there are no air bubbles. Air in the soil can prevent the seeds from taking root. Water the seeds immediately after planting. It's important that the seeds have a good supply of water after being planted. During the summer, the pumpkins will need to be watered regularly during extended dry spells. Thin out the seedlings once the plants have three or four leaves. Leave only one seedling in each planting hole. Because pumpkins need a lot of room to grow and require full sun, it's best to plant them at the edge of your garden or in their own separate plot. Remove all weeds from your pumpkin patch regularly during the growing season. Pumpkins are ready to harvest when they are deep orange. When harvesting, use a sharp knife and leave 3 inches or 4 inches of the stem intact.